The last time I updated you on what I've been using daily for skincare, I think, was back nearly 2 years ago. If you want to see that, click here to read "CRUELTY FREE SKINCARE FAVOURITES". 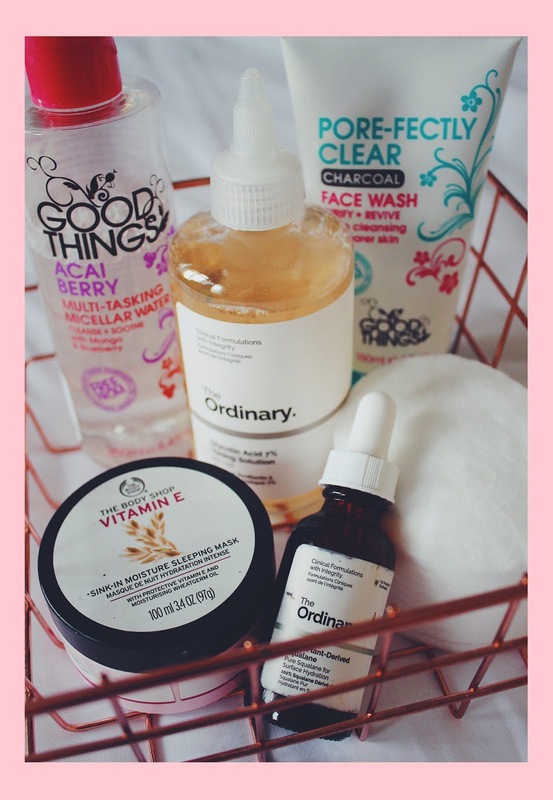 While I've shared with you some skincare products, I think a full evening routine on products is well over due and so I thought I'd share with you my recommendations today. This is probably the one product that regularly changes but, at the moment, I've been reaching for The Good Things Acai Berry Micellar Water. Good Things was a brand I used to love back when my teenage skin would break out unbelievable amounts. Sadly, after stopping to be stocked in Boots, I had to try other things but after seeing this in my local Home Sense, I've fallen back in love with the range. It is quite a strong scented product but I love how fruity it is. Also, of course, it does the job of removing my make up. I usually use two cotton pads to remove the day's make up. In the same trip to Home Sense, I saw this Good Things Pore-Fectly Clear Charcoal Cleanser. While it wasn't the one I originally loved back in the day, it works just as well at removing any left over make up and other impurities. Since using this product daily, my skin has rarely broken out. It's a really good all round cleaner that's great for everyday use. Toner is always a step I tend to forget but after discovering The Ordinary Glycolic Acid 7% Toning Solution I haven't missed a day of toning. As per the instructions, I use this once per day usually at night before I apply any other serums or moisturiser. While it is effective, it does cause my skin to redden while it sinks in and can have a little stinging sensation. I have really noticed a change in the texture of my skin since introducing this into my evening skin care. It's also helping in reducing scarring on my face that I think is still there from when I was a teen. If I remember and if I feel I need it I also like to add a serum. My fail-safe is always The Ordinary 100% Plant-Derived Squalene. This just adds a little more hydration to my skin which my skin always could do with. Lastly, it's moisturiser and I usually just use my forever favourite Superdrug Naturally Radiant Day Cream which I've banged on about enough in the past. Instead, I thought I'd include a well-loved favourite that I spoke about a little in my "CRUELTY FREE BEAUTY: SKIN CARE SAVIOURS" a while ago. That is The Body Skip Sink-In Moisture Sleeping Mask. This is the most hydrating product I own and I know if I use this I will be waking up with perfectly hydrated skin in the morning. For me, this has been the best evening skincare routine that works for my skin. If you too have fairly combination skin with fairly dry skin, these products would be great for you. Do you have any skincare recommendations you'd like to share?